On March 28, Tel Aviv will host Blockchain & Bitcoin Conference Israel, a large conference dedicated to all things related to blockchain technology, cryptocurrencies, and ICOs. Speakers will discuss the future of the crypto industry and blockchain companies will present their exciting, new developments. 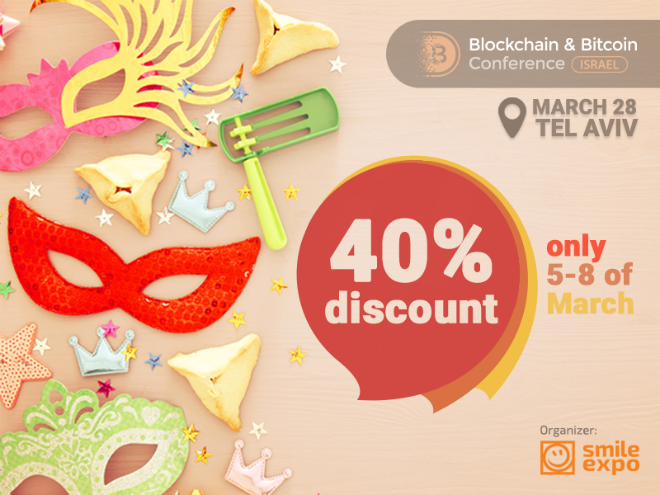 To celebrate the wonderful Jewish holiday of Purim, where people dress up in crazy costumes and it’s considered a mitzvah (good deed) to get drunk, the organizers of Blockchain & Bitcoin Conference Israel present a discount of 40% for the event’s participants. The special offer will only be valid from March 5 to March 8 for the Full Access Conference Pass. All conference participants who register on the website and buy a ticket between March 5 and March 8 will automatically receive a discount of 40%. During this period, the ticket will cost only 900 shekels instead of 1500 shekels. The promotion does not apply to the Student Conference Pass. It will still cost 350 shekels. Hurry up to register and buy a ticket! On the conference day, the ticket price will be 2000 shekels. Invest in Blockchain will be at the Blockchain & Bitcoin Conference on March 28 at the InterContinental David in Tel Aviv, Israel. Even if you can’t make it in person, we will be providing coverage of this exciting conference to our readers. Follow the news of the event and the program updates on the official website of Blockchain & Bitcoin Conference Israel. Hope to see you there!